That’s the kind of impossible puzzle that any large public school district faces. But the Oakland Unified School District’s food services program may soon have a new tool with the potential to make solving this puzzle slightly more manageable. This week, the district’s school board will vote on whether to adopt the Good Food Purchasing Policy (GFPP), a set of purchasing standards that assigns participating school districts a “grade” based around five core values: nutrition, environmental sustainability, animal welfare, valued workforce (i.e., labor issues), and local economies. 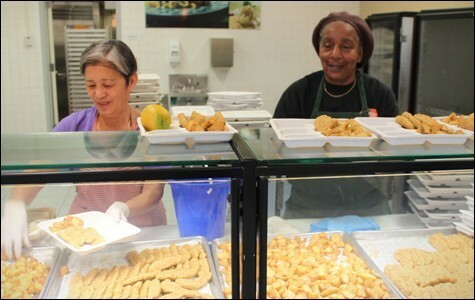 OUSD is the third school district to adopt the Good Food Purchasing Policy, joining the school districts of Los Angeles — where the Los Angeles Food Policy Council first created the program in 2012 — and San Francisco, which adopted the policy earlier this fall. The Center for Good Food Purchasing, a Berkeley-based nonprofit, administers the program. Its executive director Alexa Delwiche said that OUSD was a natural fit because the district already espouses many of the policy’s values. The GFPP aims to give those values around sustainability and nutrition some teeth. In a nutshell, the Center for Good Food Purchasing collects and analyzes reams of paperwork from each participating school district to determine where every purchased ingredient came from — tracing it back to the name of an individual farm when possible. The Center then evaluates all of the data against the five criteria in its rubric, and assigns the district a star rating. In fact, even prior to officially adopting the policy, OUSD already went through this part of the process — twice, actually, in a kind of voluntary test run. The district received two stars, out of a possible five, for the 2012-13 school year, and went up to a three-star rating for the 2014-15 school year. Moving forward, the Center will work with OUSD to set short-term and long-term goals, and it will help hold the district accountable for reaching those benchmarks. The goal, after all, is to achieve that perfect five-star rating. The OUSD school board is expected to vote in favor of adopting the Good Food Purchasing Policy at its October 26 meeting, though it won’t be until after a later vote in March or April that the procurement policy would officially get written into the district’s priorities. When the Los Angeles school district adopted the Good Food Purchasing Policy, it was preparing to negotiate a $60 million chicken contract with Tyson Foods, a multi-billion dollar company that has been fined for worker-safety violations. The upshot: After these concerns were raised, Tyson withdrew itself from consideration for the chicken contract, and the district instead committed a large chunk of that money — about $20 million, according to Delwiche — to buying antibiotic-free chicken through a different distributor. The district also went from purchasing just 9 percent of its food locally to 50–60 percent — a shift that put $12 million into the local economy and helped create about 150 jobs. With both the San Francisco and Oakland school districts most likely adopting the standards this year, and several other districts around the country interested in following suit, we are starting to see the makings of a larger movement — one that, in aggregate, has enough purchasing power to really shift the country’s overall food system. One of the notable aspects of the Good Food Purchasing Policy is that it places a priority on labor issues, which often get overlooked within the broader food justice movement. For that reason, the Teamsters have thrown their support behind the policy. Doug Bloch, the political director for Teamsters Joint Council 7, which covers much of California, noted that the policy played an instrumental role in securing a contract for union delivery drivers in Los Angeles. This isn’t just an abstract concern: In Los Angeles, for example, longtime nutrition services director David Binkle, who had advocated for the Good Food Purchasing Policy, resigned last year amid allegations of mismanaged funds. In both Oakland and Los Angeles, the policy itself ensures that these core values — of sustainability, worker well-being, and so forth — remain locked in as district priorities, even as individual policymakers come and go. And it gives suppliers such as Taylor Farms a tangible reason to change their practices. Bloch, LeBarre, and Lappé will discuss the Good Food Purchasing Policy at a Real Food Media-hosted event on Monday, October 24, at the David Brower Center (2150 Allston Way, Berkeley).